2. Open Project Structure -> Global Libraries and create a library with scala-library.jar and scala-compiler.jar files. Right now scala plugin has these names hardcoded and will fail if you use different names. 3. Open Project Structure -> Facets and in every scala facet select the library created in step #2 as Compiler Library. 4. Stop FSC if you have it running. There is and icon in the status bar. Click and select Stop. Is that from an external hard drive? No, its my SSD. Its internal. However the directory containing the idea project is soft linked to the SSD (on lunix). does it work when you don't have soft links in your project? I just run full rebuild several times on a project that consits of 28 modules. Production code is mostly java with several scala files. Tests written in scala and java. Warm external builder with zinc is 50 sec faster than warm FSC on one of our projects. I did Build -> Rebuild Project several times. The first run is cold, 2nd and 3rd could be considered warm runs (VM should optimize/compile some compiler code already). Looks like on as single module project (only scala code) doing Rebuild is faster with FSC in IDEA. The problem with links is fixed in the latest plugin builds. Probably you are using "compile independent modules in parallel" option? 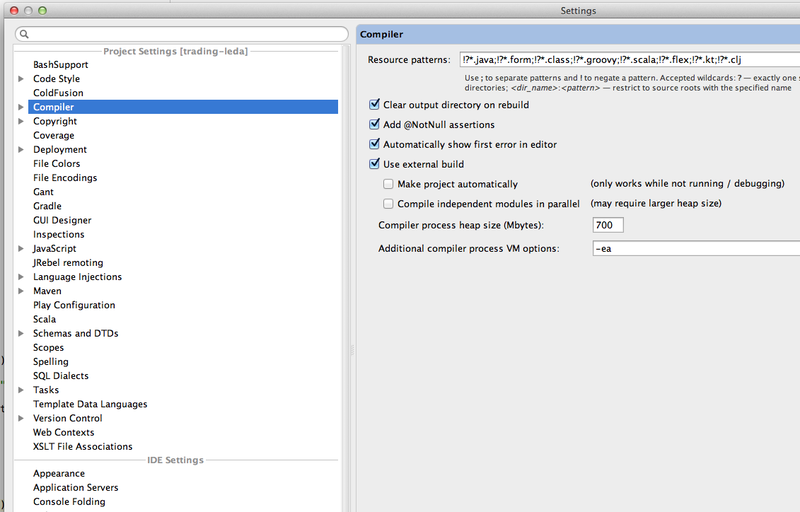 No, I don't use "compile independent modules in parallel" option. It doesn't work in my case. When I open a project with ~ 20 java modules with tests written in scala IDEA fails to resolve dependencies between these modules correctly. I don't really care about the cold run, since I do it only once in a month. But what I care about are warm runs, because they are executed more than 100 times a day and they majorly influence the time to test and debug code. Is this difference between FSC and the new compiler supposed to be? Did I have to set certain compiler options to increase the speed? I already set the same parameters for both compilers (Xmx, max heap size) but it didn't change anything. The option "Run compiler server (in external build mode)" is checked. Does this mean IDEA uses nailgun to compile the project? Hi Stefan, we'll check that soon.